Look at this DAX example on a 15 min chart but using entry on a 3 min was even better. 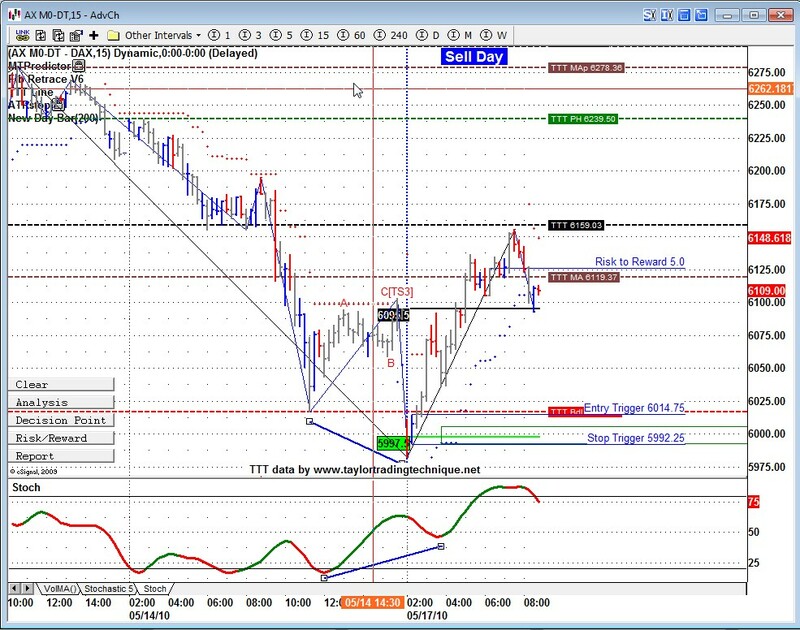 DAX opens right in the DP zone and reverse immediatly to close the gap. Quite pleased with my Taylor's calculations working out on ESmini as well. Do not trade the market but do keep a watch on it as it dictates the movements on other markets. As you illustrated a couple of hours on Dax or Ftse is enough per day to get by. When you mention TTT violation, is that the violation of Yesterday's (sell day) low. My table shows a value of 1103 for projected low as the sell day low was around 1113, whereas the market is hovering around 1124 Buy Day Low. sorry I meant Penetration and I just noticed you had mentioned it. On FTSE and Dax, there were certainly BV long scalps on the open. Wow Rigel. It really doesn't matter if the markets follow the Taylor sequence or not, you always have a positive "get it on" attitude. Something to strive for, at least for me. Way to go.